Peanut Butter Banana Power Muffins are a meal in a muffin! 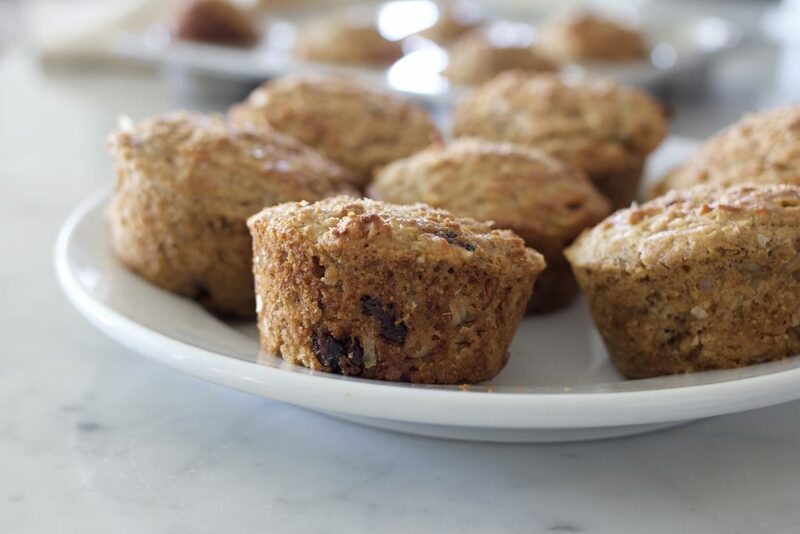 The banana, peanut butter, nuts, raisins and coconut are the main ingredients in this muffin and will give you energy to get through a busy morning! A few years ago, my daughter Brookie started running. It was a long, slow process for her. She was determined and started out with a mile, and now, there’s no stopping her. 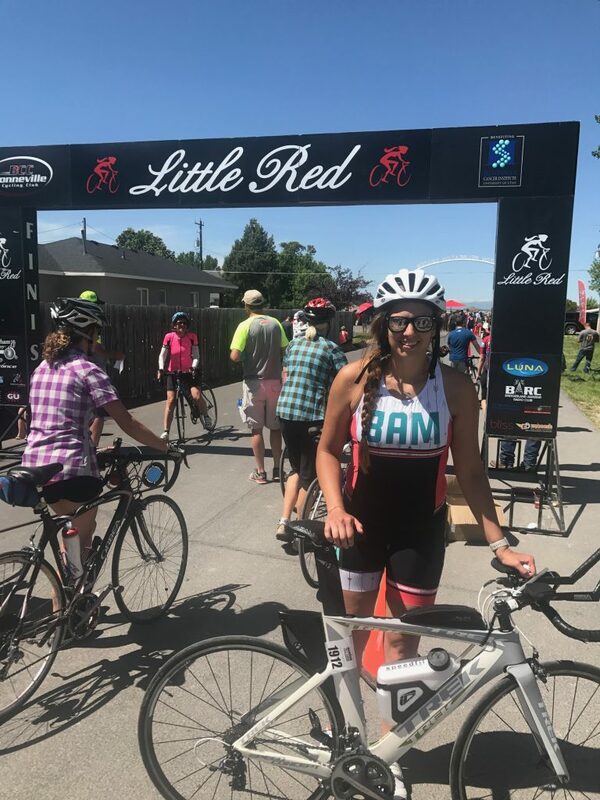 Several marathons, half marathons and half Iron Man races later, Brookie is currently training for a full Iron Man this summer. What’s an Iron Man triathlon? Swim, run, bike. All in one day. It consists of a 2.4-mile (3.86 km) swim, a 112-mile (180.25 km) bicycle ride and a marathon 26.22-mile (42.20 km) run, raced in that order and without a break. I’m tired just typing that! Brooke is like her father, when she puts her mind to something the sky is the limit. One thing I’m always hearing from my Brookie is “I’m SO hungry!” That’s not a surprise, given she’s burning so many calories working out each day. I thought it would be fun to surprise her with a mega breakfast treat. Something she can make ahead and freeze and then just pull out and eat during the busy work week. I started by asking her what would go into the perfect breakfast muffin. We came up with this list: wheat flour, greek yogurt, peanut butter, brown sugar, banana, raisins, coconut, and nuts. 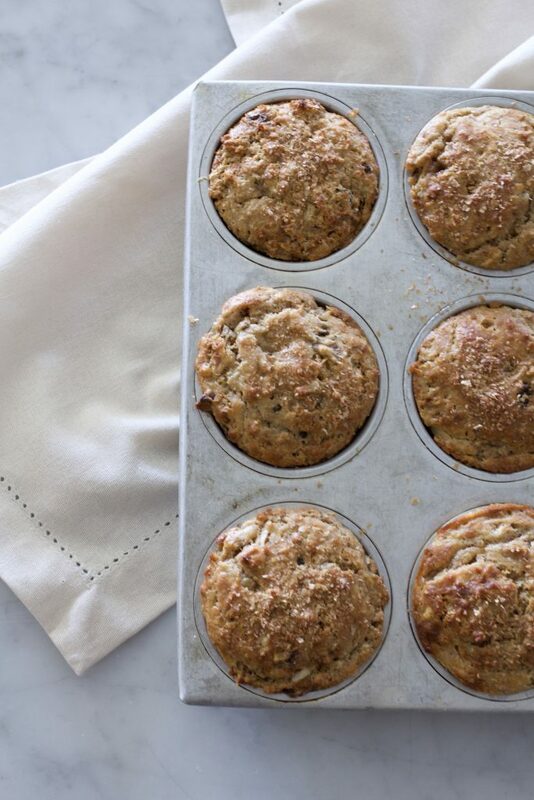 Peanut Butter Banana Power Muffins are not your mama’s muffins. They are not too sweet, full of goodness and won’t leave you hungry in an hour. I love them with a spinach, yogurt and fruit smoothie in the morning. Whenever I make muffins, we eat a few and then I immediately freeze the remaining muffins for a quick thaw and eat, or heat and eat breakfast or snack. You can change this recipe to suit your needs. If you aren’t a fan of nuts, replace the nuts with another ingredient, such as chocolate chips, more raisins, craisins or chopped fruit. Same with any of the other filling ingredients. I love coconut in this muffin, but again, if coconut is not your thing, just substitute another ingredient! The key to making a recipe your own is to replace the tried and true version with another like ingredient. Meaning, if you are substituting out coconut, use another ingredient that is similar in volume or texture. Substituting applesauce for coconut or nuts probably won’t work, because applesauce is too wet. Try other dried fruit, nuts or cereal (such as bran flakes). Chocolate chips would also be a great addition to this recipe! Peanut Butter Banana Power Muffins and those overripe bananas on your counter! I ALWAYS have overripe bananas on my counter. They go from the counter to the fridge, to the freezer. I can’t bear to throw them out! Sometimes, I peel the bananas and throw into a Ziplock bag so I can easily use them for baking or smoothies. Overripe bananas are perfect for this recipe. The darker the peel, the better. Overripe bananas make a perfect sugar substitute in baked goods. 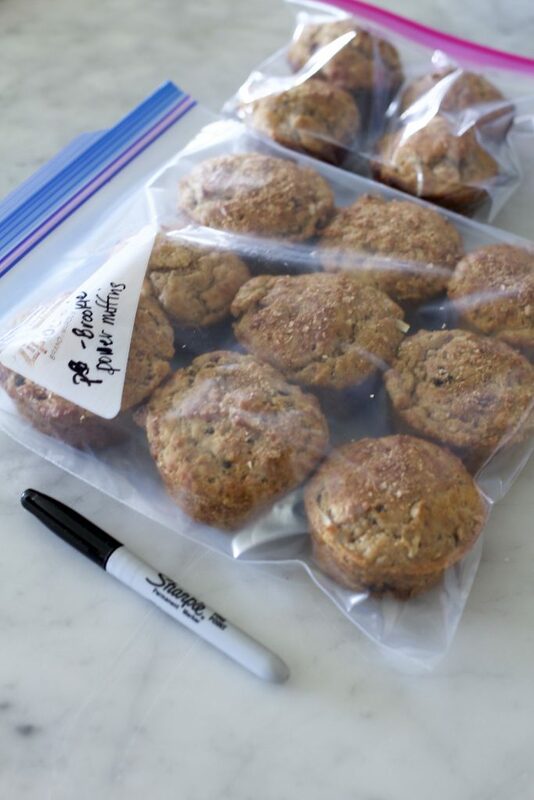 Peanut Butter Banana Power Muffins are just sweet enough to satisfy a sweet tooth in the morning, but not so sweet that they sabotage your workout! Pre heat oven to 400 degrees and place the rack in the center of oven. Place mashed banana, greek yogurt, peanut butter, oil, eggs and sugar into a bowl and mix until blended well. Add brown sugar and beat on low until smooth. Add flour, soda, powder, salt and walnuts. Fold in with a spatula just until the flour disappears. Fold in nuts, raisins and coconut. 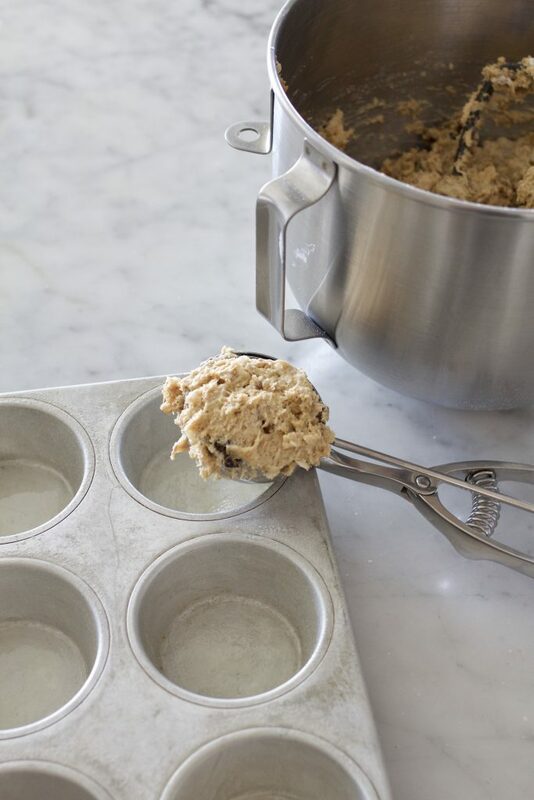 Scoop batter into greased muffin tin. Fill to about 3/4 full. Bake at 400 degrees for about 15-18 minutes or until center springs back when touched. Or insert toothpick in center of muffin. When toothpick comes out clean, muffin is done. Just so I understand correctly, I can use wheat flour, just wheat, or white flour in the amounts you listed. But not all three together? I use a combination of wheat and white flour. You may use all wheat flour, if you do the texture of the muffins will be quite heavy. I like to lighten it up just a bit with a little white flour. thanks for reading, and hope this answers your question! I liked these and my kids gobbled them up as well! I made a few additions/adjustments. I added 4 Tbsp Flax seed, cut sugar down to 1/4 cup, used slivered almonds and omitted the coconut. I thought they were plenty sweet because of the bananas. I used natural PB, to avoid extra sugar. Next time I want to try it with almond butter. I used almond butter instead with great results! What is your favorite brand of wheat flour? I usually purchase King Arthur brand flour! I have also used Gold Medal both are quality products! So if we are using all white flour, how much would we use? the same amount or a little less? I would use the same amount of white flour 1 1/3 cups total if you are using all white flour. Hope you love this recipe! I just made these yummy muffins at midnight for my hubby to grab on his way to work. He needed to start his birthday off right and these were perfect for my stud muffin. I added a few mini chocolate chips because he LOVES chocolate. Thanks for this delicious recipe! 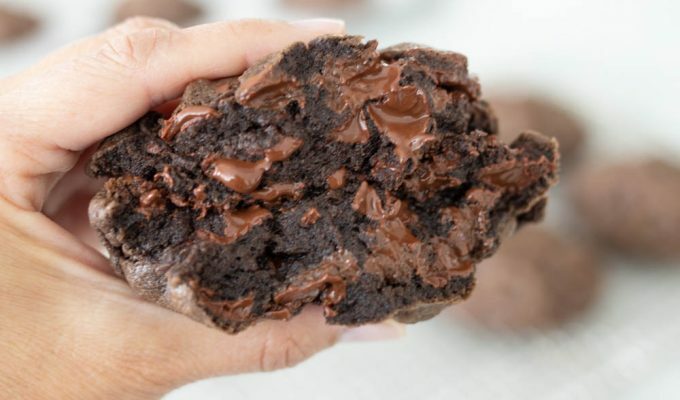 Chocolate chips sound like the perfect addition to this recipe! Thanks so much for reading ABK! Made these for snacks for my family today. They were a hit. Since I’m allergic to peanut butter, I used sun butter and almond butter in place of peanut butter. Next time I’m going to throw in a few choc. chips, but they were great without the choc. too. Thanks for a healthy, protein packed muffin! Hi! Can you use a combo of almond and white flour or just almond flour? Thanks! Hi Iris, You may use either or, OR a combination of flours. I used coconut flour because that’s what I had on hand! Sorry I was a little confused when I answered the first time! The comments show up in my feed in chronological order and I had just responded to a question about a cookie recipe. I thought this comment was also from that post! I haven’t tried almond flour in this recipe, but Im fairly certain it will work. 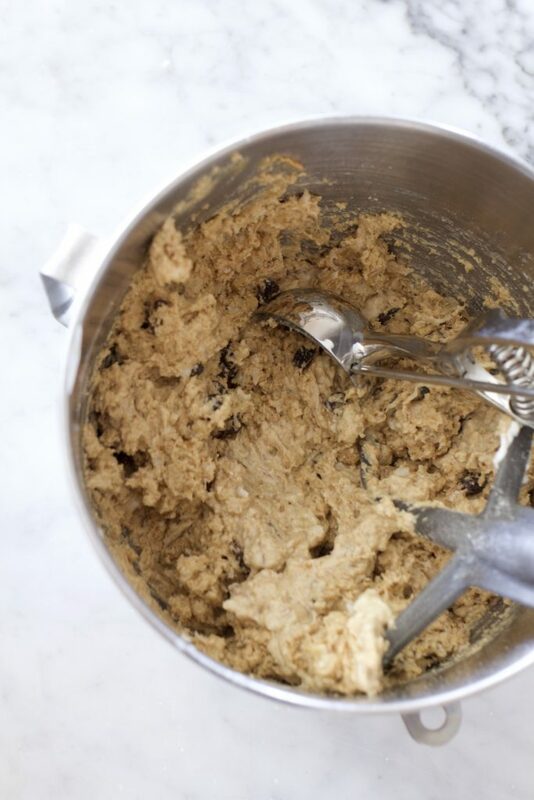 As with all flours that are gluten free, I suggest allowing the batter to sit for about 10-15 minutes before baking to allow the flour to absorb some of the liquid in the recipe for better texture. Looking forward to trying this recipe. Just curious why you recommend not chopping the nuts. I measured and threw in nuts unchopped and then allowed the mixer to break up the nuts while on low speed. If you want to chop the nuts, reduce the nuts by 1/4 cup. My husband is doing an Ironman too and this is exactly the snack I’m looking for for home! Thanks! Is there a substitute for the Greek yogurt? Scared the muffin might spoil with the yogurt if he takes it with him on long bike rides. I don’t think you’ll have any issues with the Greek yogurt spoiling because it is cooked in the muffin! It is no different than using milk or eggs in a recipe. He will love this filling muffin on his long rides! You should also take a look at the Levain Bakery Chocolate Chip Cookie post. The recipe was developed specifically for two women who were training for a triathlon!